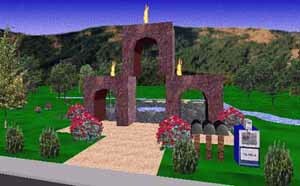 Sherwood Forest Community is an experiment in community building and culture in a real cyberspace world (AlphaWorld). Sherwood is being planted and populated by members of the Contact Consortium, and organization dedicated to studying, publicizing and enriching the Internet-hosted 3D worlds as a new space for human contact and culture. Contact members are individuals from universities, companies and government institutions interested in culture and contact in cyberspace. Consortium members have years of experience in designing and running MUDs, MOOs and in world building exercises and will apply this to the Sherwood Forest Community Project. We plan to write articles and papers documenting this experience. The purpose of Sherwood is to try and design a very natural, attractive setting with woodlands, flowers and water and then build a village community in that space. If you would like to join the consortium or join this project, please contact Bruce Damer Director, Contact Consortium. To create a viable community within this new medium of human interaction and to observe how this community will be built, grow and work. WHERE: Virtually in AlphaWorld: 105.4N, 188.8E 180 (degree skew) at the front lot by the postboxes. WHAT WE WILL DO: We will continue to build our towne and our community! a lovely natural setting of woods, lakes, bordered by an ancient aqueduct left over by our long fallen cyber ancestors. Pie in the Sky Bakery, plans for Towne Hall. town charter, roles: Mayor, Sheriff, Lady of the Land, Towne Architect, Priest and Rabbi, Historian and Cartographer, Towne Administrator, Towne Crier, Village Idiot? We will report on all of this on the web site and post screen shot pictures of our activities. See Scenes from the first and last Sherwood Community Days! And see the Hot New Sites Going Up! Use our website as your guide both before and after the May 4 event. If you have a Windows 95 PC (486/66 or above) and a normal Internet dial up connection at 14.4 or greater, you can participate. 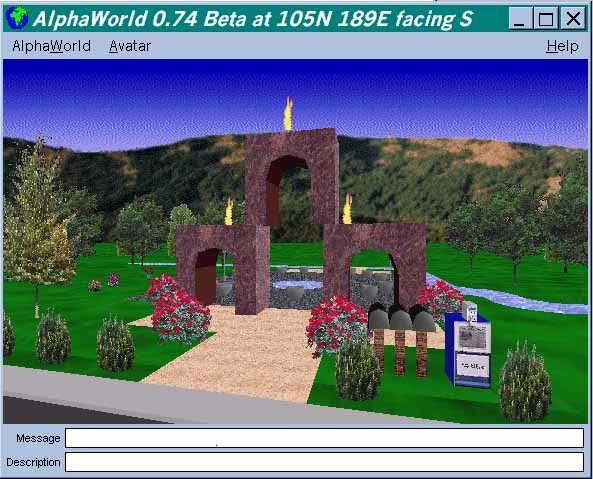 To equip yourself with Active Worlds and visit AlphaWorld (home of Sherwood), follow the instructions on our web site to download the Active Worlds Browser. Please let us know if you can join us and at about what time (GMT) you will be coming in. If you want to build you must register as a participant in Sherwood and we will distribute you the DigiGardener shared Avatar. Please contact Bruce Damer of the Contact Consortium to participate in this event. To continue to participate in this and other projects, workshops and symposia, Join the Contact Consortium!